On one of the recent trips to my favorite soul food restaurant, MacArthur’s, as I sunk my teeth into the crunchy fried catfish, I heard the lady in the next booth lament to her friends that she had lost the recipe for, “the best d–n sweet potato pie” she’d ever had in her whole life. Further eavesdropping revealed that said sweet potato pie was none other than the one by Chef Leah Chase of the famous Dooky Chase Restaurant in New Orleans, one of whose fans is the President himself. I thought of telling that lady and her group that I knew the recipe by heart. But since fried catfish was my priority at that point, I waited. By the time I was done with my meal, wiped the grease off my hands, and poked my head into the next booth, those ladies had left. Well, I hope somebody who needs this recipe is reading this. This is my moderately adapted version of the sweet potato pie recipe belonging to Chef Chase from the book, In Julia’s Kitchen with Master Chefs. I have made sweet potato pies this way ever since I saw Leah Chase on Julia’s PBS show several years ago. It’s a no-frills recipe which is very delicious. What makes it unique is the finely-chopped pecans that are mixed into the crust and the fact that the sweet potatoes are mashed by hand resulting in a filling that has more body and is more — to use a word so abhorred by sophisticated food writers — toothsome. No bourbon, crème fraîche, or any of the fancy add-ins. Just a solidly excellent down home sweet potato pie. In a food processor, pulse together all the dry ingredients and the butter into short bursts until the mixture forms pea-sized lumps. Add the water through the feed chute as you pulse until the mixture forms a stiff dough and pulls away from the sides of the food processor bowl. Form the dough into a 6-inch disk and wrap it in plastic; chill for one hour. The dough can be made in advance. It can be kept refrigerated for several days and even frozen. Put the sweet potatoes into a medium pot and cover them with water by an inch. Bring to a boil. Boil slowly until the potatoes are tender with no absolutely no resistance at the center when pieced with a fork. Drain off the water and mash the potatoes with a potato masher. Do not use a potato ricer or food processor. As you mash the potatoes, add the sugar, cinnamon, and nutmeg; then whisk in the eggs, milk, and vanilla. The butter goes in last. Once the filling is well-mixed, pour it into the baked pie crust. 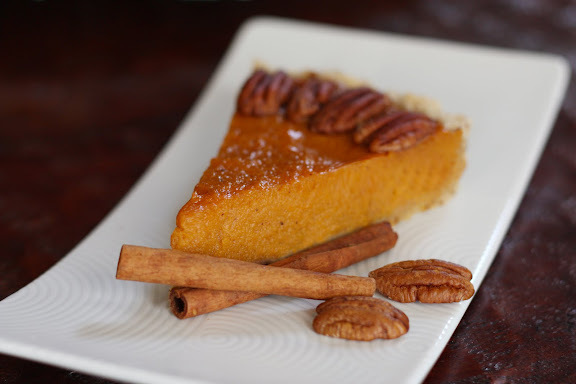 Arrange pecan halves around the outside edges and sprinkle the top of the pie with more ground cinnamon. Bake for 20-25 minutes until the filling is set and the edges of the crust have browned. Serve the pie warm or at room temperature with whipped cream or vanilla ice cream. Chopped peacans in the crust…sounds amazing…Since I love peacans I am going to have incorporate this idea in my next pie! I literally drooling at that pie. I really want some right now. Favorite ingredients, too. You can’t go wrong with that. Ahhhhhhhhhhhhhhh! Do you know we’re both huge sweet tater fans? A sweet potato pie is just the tops! That crust looks like one to try! That does look like the best sweet potato pie ever. I love the pecans in the crust! This is the most perfect looking pie ever! I love the addition of pecans! My mom loves sweet potato pie, and I’m planning on make this one for her. For the crust, I plan to use a combo of shortening and butter for a tender, yet flavorful crust. Thank you! Just stopping in to say “hello” and love your blog! Great pics and recipes…..I hope to try the sweet potato one! 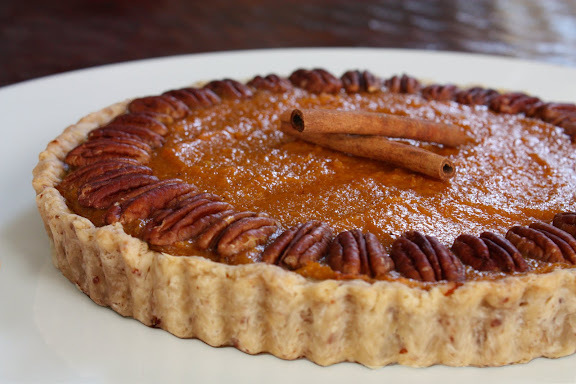 I like the idea of the nutty crust, and the pecan decoration looks pretty too. I feel sorry for the lady who missed out on the recipe because of a catfish! Even though I know the filling is always the best part of the pie, I have to say I’m particularly drawn to this incredible crust and the pecan decoration on top. I love the extra touches! That pie looks about perfect! Love the nuts added to the crust, also. The one thing I do to my sweet potatoes that others don’t is to steam, rahter than boil, them. I find steaming makes for a lovely filling. I promise for-ever— I think I’m in luv with your cookin-simmerin blog! Oh my – I did not even know I was missing this recipe until you pointed it out and thank goodness I know have it firmly in my procession as I am not letting go. Can’t wait to awe and amaze the in laws this holiday season. Hope my turns out at least half as good as yours. I made this pie for Christmas and it was a hit.. Thanks for posting the recipe. I love Dooky Chase restaurant. I just saw her show on the Travel Channel and she basically adds more sugar than 1/2 cup, she says to taste and add. This is what I do, also I like someone’s idea to steam the potatoes, but never, never peel them, either boil or steam them with the skins on and when they are done, the skins peel off nicely when the potatoes are warm. The sugar in the skins add to the potato, so leave the skins on. On the crust I would use lard mixed with the butter, this combination makes a tasty/flaky crust. 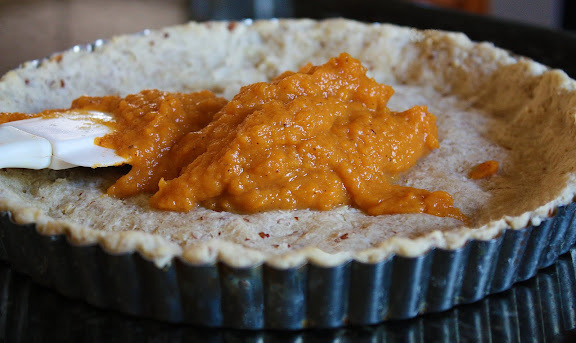 Can’t wait to make this pie, but have to find sweet potatoes, not yams. It seems the local stores in my area always have yams, and they are not sweet potatoes. Thanks for the recipe. Jeanie – That’s very helpful. Thanks, Jeannie. I had never heard of the sweet potato pie that Leah Chase makes until a couple of days ago I was watching The Food Network channel. After that I was determined to find that recipe. Your pie looks delicious. I can’t wait to try it…and that crust? Yummmmm. Thanks for the inspiration. In the filling it calls for condensed milk – would that be “sweetened condensed milk”? In pumpkin pie recipies I’ve used evaporated milk – probably not the same thing… Do they make an unsweetened condensed milk? Anon – It’s indeed sweetened condensed milk. Thank you. I should have made it clear in the recipe. Thank you so much for posting this recipe. It looked so easy when I watched Leah Chase make it on youtube. I can’t wait to try out this recipe and taste the pie. God Bless! Iv viewed the actual utube video of Leah Chase and Julia making the sweet potato pie…and think all your measurements are for two pies right….did you just forget to mention it? Glad you brought it up. Thank you. Actually, no. For some reason, every time I tried to make two 9-inch pies with the original recipe, I was short of filling. So I adapted the recipe to be for only one pie. Love your pages!!! Can I make the crust with no food processor? Can’t wait to try this. I made your Tom Kha Gai – I am addicted! Going to be on these pages a lot. Thank you thank you thank you! Mary, thank you. Yes, you can. Simply use a pastry hand blender to blend the dry ingredients until they resemble small peas in size, add the chopped pecans, then with a rubber spatula gently form the mixture into a ball of dough while slowly adding the liquid. Thanks sooooooo much for this recipe. Saw this on PBS the other day & have been searching for this ever since. Also the Fried Chicken & Buttermilk Biscuits recipes!!! Am making complete meal ASAP! Can’t wait to make this pie !!! Recipe indicates “Do not use Potato Ricer or Foor Processors”. Any particular reason why not? I would think a smooth texture of Sweet Potatoes would be delicious or is a lumpy texture something that should be achieved? Thank you. GreenQueene – It’s the chef’s preference. She wants the filling to have some body to it.